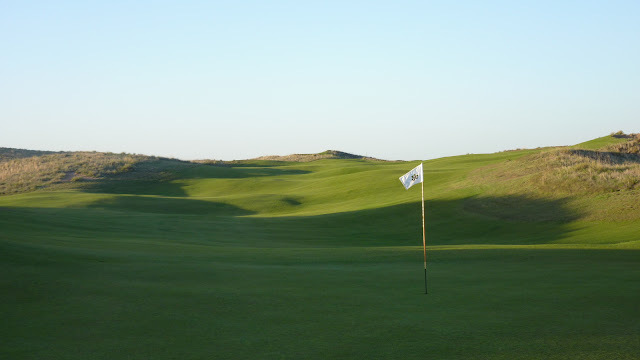 The difficulty of the second hole depends greatly on the wind conditions. 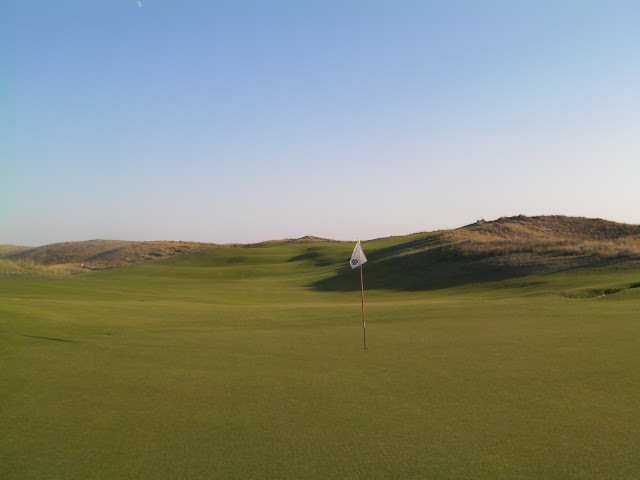 Downwind, you might be left with nothing more than a pitching wedge to the green. Into the wind, it's a three-shot hole for many. Choose your tee boxes carefully. I play the most of my rounds from the lower, left tee box, which is the first flat piece of grass you reach coming off the first green. This is probably more than enough if you're playing into the wind. The view of the fairway is masked from this tee box, although you can see a hint of the large right bunker where Doak installed a giant golf-ball magnet just beneath the surface. Take your medicine if you find that bunker. 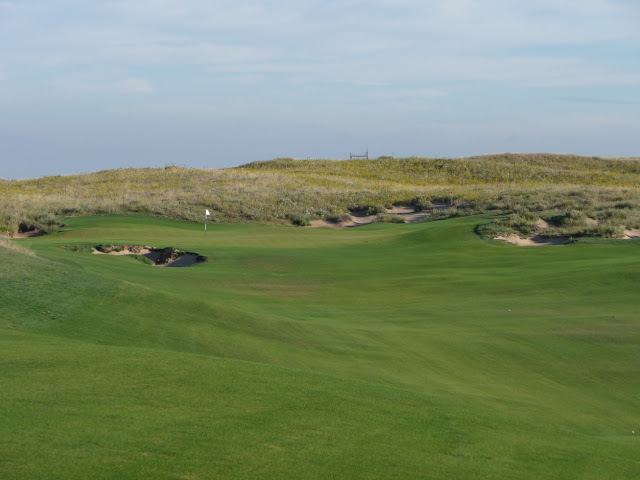 If it's downwind, march up to the upper tee box, tee it high and let it fly. 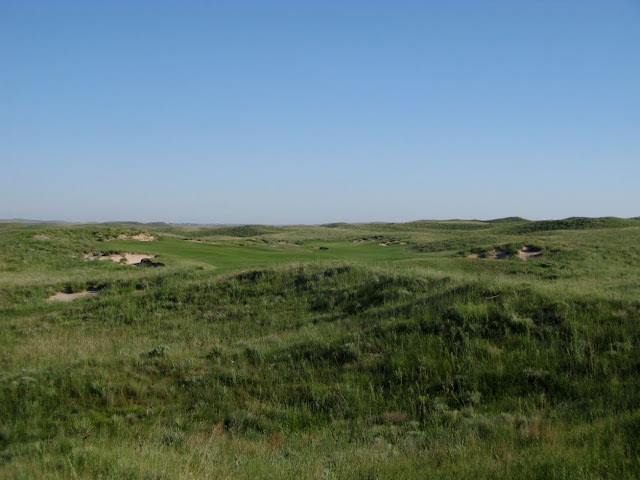 The back tee is the highest point on the course, so don't forget to look back over the first hole and check out the rugged Chop Hills. From here, you can tell that the fairway is extremely wide, so swing confidently. The key is hitting the ball far enough to take advantage of the big turbo-kick from the fairway slopes. Like I mentioned, you may be hitting fairway wood into this green. Or you might only have 140 yards left. 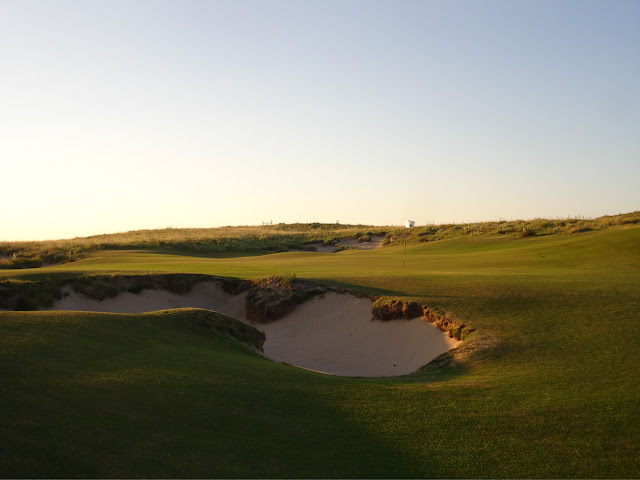 In either case, the ground game is definitely an option here, allowing you to run a shot up between the two bunkers. 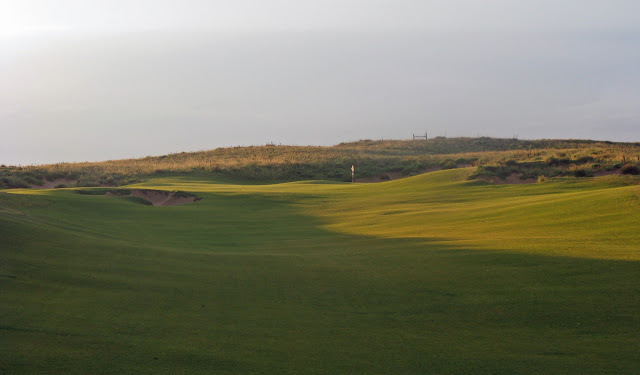 Just make sure to avoid the short left bunker, which is at least 5 yards short of the front edge of the green (most likely leaving the dreaded long bunker shot, though this native sand is a dream to hit out of). If the pin is right, you'll be tempted to land your approach just beyond the right bunker and let the backside of that hump feed the ball down to the hole. I'm sure this is the right play, but I've never been able to pull it off successfully. I usually yank it too far right and make double bogey out of the junk to the right. But that's only because I'm not very good. Left is not a bad place to miss either, usually providing a straightforward pitch or putt for a good chance at an up and down. Make sure to look back up the fairway when you finally reach the green. The sheer magnitude of the slopes tumbling down to the green is impressive and never gets old for me. 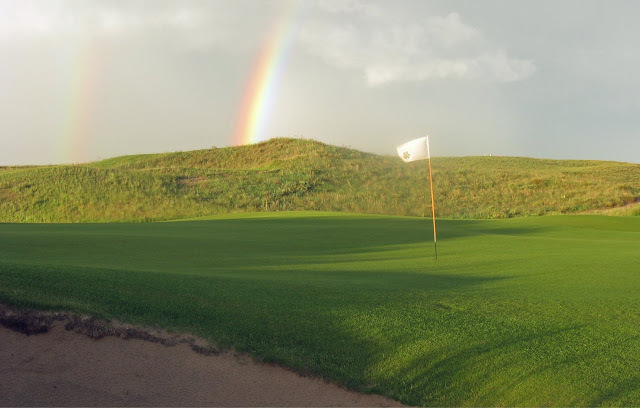 A par on the tough 2nd hole will have you counting your lucky charms. One of my favorite par 4s on the course and one of my favorite long par 4s anywhere, though most will disagree as there is more great stuff to come. 1-7 is probably my favorite stretch at Ballyneal. You could throw 8-9 in there too and just call it a wonderful front nine but I am trying to be selective! This is a tough golf hole. So much is determined by the drive. As JC alluded to, if you catch the downslope in the fairway, you're looking at 7, 8 or maybe a 9 iron. If your drive gets stuck up on the top tier of the fairway, you could have a 5 wood in your hand. Knowing all that while standing on the tee can toy with your mind, making it that much more difficult to hit a solid drive. 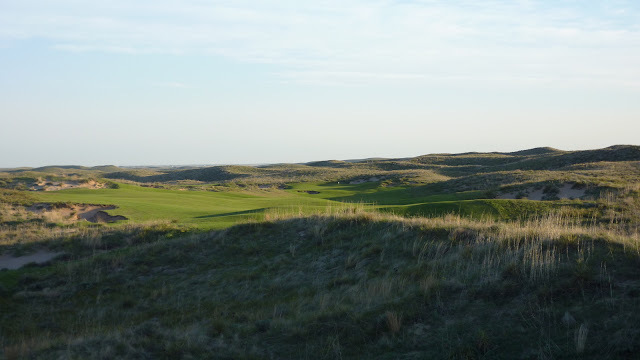 One of my favorite holes at Ballyneal. I agree with Jimbo, so much is determined by the drive. If it isn't caught perfectly, a long iron or wood will be left from a downhill or sidehill lie. 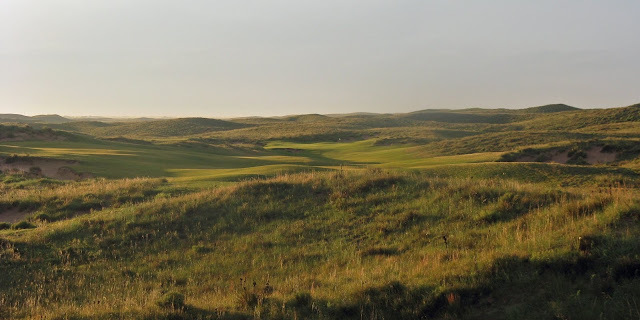 With the firm and fast conditions at Ballyneal, the approach will have to be landed short of the green unless you have a short iron in your hands. Thankfully Doak allowed the possibility for the golfer to chase the shot onto the green, and may have actually encouraged this type of shot as the bank to the right of the green will allow the golfer to play away from the front left bunker and still get his ball on the green. 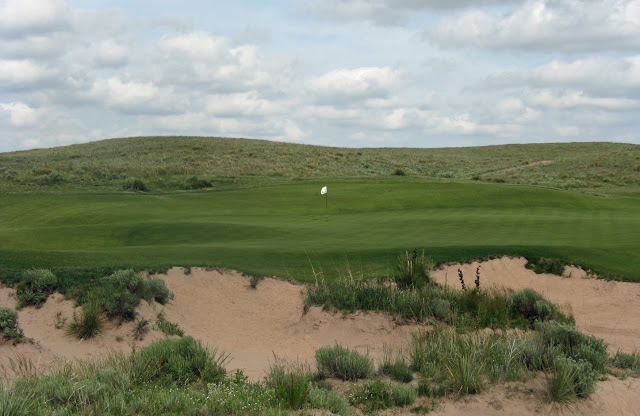 Probably my favorite second shot at Ballyneal, if it is pulled off properly. Avoid the front left bunker at all costs!